The 7th year of Next Level Officials Camp is open and ready for registration, boasting another incredible, diverse group of clinicians! Held at Edmonton's Premier 12 Court, Saville Center, this camp is designed for referees who want to either learn, gain experience, or take their game to that "next level" in 3 Person FIBA Mechanics. Our goal is to provide competitive, high-level basketball, in conjunction with Rick Stanley's "Rocky Mountain Team Camp", with on court and classroom feedback in a positive atmosphere. This year's camp offers expert instruction in 3 Person FIBA Mechanics, videotape analysis, on court immediate feedback, engaging and valuable classroom sessions, along with a social event offering a hot meal, cash bar, and a fantastic opportunity to wind down and network with staff and the camp group. Next Level Officiating Camp was created by Karen in 2012. Her vision to cultivate and create up and coming FIBA officials has lead her to bring together a phenomenal team of educators of the game. Her primary desire is for officials to leave with the resources necessary to assist them in reaching their officiating goals. Karen's vast resume gives her an unmatched level of experience and a unique perspective. She currently topped off her FIBA career at the recent 2016 Rio Olympics, and continues as an active CIS, ACAC, and NCAA Division 1 Official. 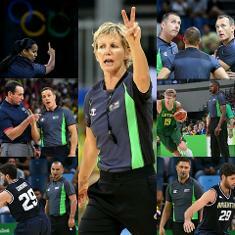 Making history as a member of the first ever, all female crew for the Championship game in the 2015 European Women's Basketball Championship, she has also worked World Championships, Pan Am Games, Universiade Games, FIBA Americas Championships, Olympic Qualifying events, CIS National Championships, the NCAA D2 National Championship Game on 2 occasions, and the NCAA D1 Tournament, 8 times. Next Level Officials Camp boasts a one of a kind staff who work levels such as FIBA Olympics, NCAA D1 Final Four, NBA G-League, CIS, NCAA D2, and WNBA. They bring a wealth of knowledge and are dedicated to helping you become more confident, believable, and an overall better official.